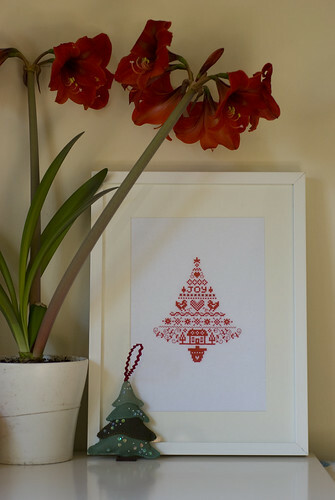 Thank you for your lovely comments here, on Twitter and on Ravelry about my little pattern. I’ll admit I was beyond excited when I actually sold two copies yesterday. To actual genuine people! Who are not my mum! Or H’s mum! Or H under a pseudonym! (I think). The income will of course be pretty much entirely going to the tax man but that isn’t really the point at this stage, for now it’s enough to know that I have done something off my mental “one day I really should …” list (and clocked off another New Year’s Resolution). I’m considering it an Achievement, and a slightly addictive one at that – I’m currently working on writing up my Phoenix socks pattern from the Cookie A class I took at Knit Nation 2010 to be a freebie Ravelry download. I’d say it’ll be finished soon but soon could mean any time in the next two years at the current rate of progress. 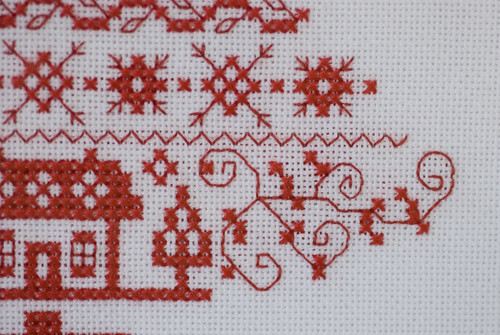 It’s the sampler Christmas tree from Cross Stitcher Christmas 2011 and the slight hitch was that I discovered when I got the top stitching that I’d missed the spacing by a row, leaving a zig zag of backstitch tucked up next to the row above where it should have had a whole extra row to stretch out in. Could you tell what I fudged? Or where? That’s the fateful zig zag running through the centre of the picture. I picked out the first zig zag that I’d stitched and took a good hard look at the space I had left, and then the beauty of evenweave dawned upon me, and all was good. When you sew cross stitch on Aida you’re (to a degree) bound by the little fabric squares. To make a nice neat stitch you use the four holes surrounding your square, and if you want to do anything different you have to start punching holes in the tightly woven squares; it’s possible but not the easiest or neatest stitching in the world (at least not when I do it). But with evenweave you skip the tightly woven squares and work across two threads, giving you a ‘box’ of nine little holes to work with. It’s the reason why counting is a bit more difficult, and also the way to solve the problem. Essentially, I dropped the zig zag line by half a row. It’s a little bit closer than it should be to the snowflakes above, and to the swirling foliage below, but not so much that it screams “I’m a ginormous mistake – look at me!”, and that’s good enough for me. I finished the stitching a while ago but it was looking a bit battered and slightly scruffy around the edges so I wanted to wait until it had had a nice press with my steam iron and a pretty frame. 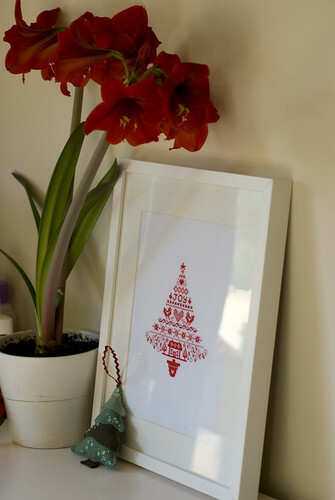 The frame is an Ikea Ribba frame and mount that claims to be white. It was the whitest one we could find in the shop and now that it’s all together I rather like the effect of the creamy mount. 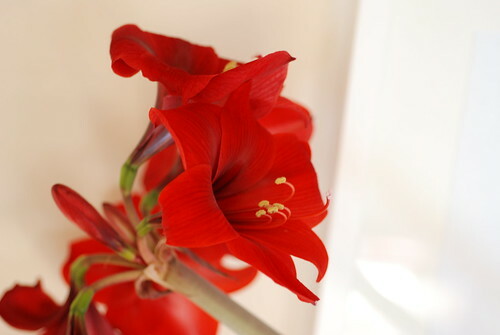 The fact that my amaryllis matches isn’t planned I promise, just serendipitous; or perhaps not, my deep and unwavering affection for this rich, warm, velvety red is what drew me to the picture on the bulb packet, and the embroidery. It’s a feast of red and white; total joy for me. Materials: White 28 count evenweave and two colours of DMC cotton. Would I make it again: Perhaps – maybe in another colour; it would look amazing in purple, or possibly green. 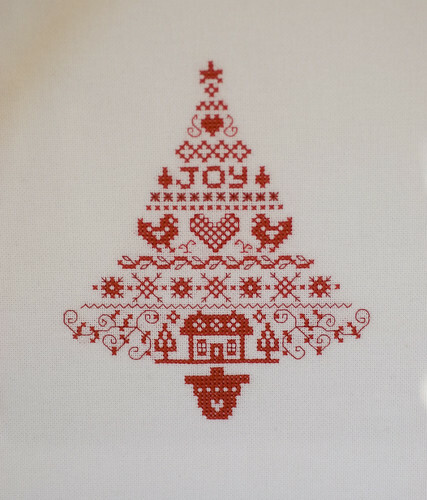 I’m really trying to stay away from yet another hobby but it seems that embroidery and cross-stitching is coming back. And I’m being pulled that direction by cool pieces like this. I’m resisting so far…but this is a beautiful FO!